Francois Coty is credited with creating the world's first chypre in 1917 - a scent that altered the course of perfumery forever. Characterised by a citrus top note (usually bergamot), a resinous cistus/labdanum heart and musky, mossy base, perfumes of the 'chypre' category used materials predominantly of Mediterranean style and origin. Curiously, whilst Coty's creation incited something of a chypre movement in perfume circles, the perfume term 'Chypre' had been in use long before Francois' famous formula hit the shelves... case in point: Guerlain, whom at the time had already produced four - Eau de Chypre (1850), Chypre (1887), Cyprisine (1894) and Chypre de Paris (1909). Thanks to the efforts of Guerlain perfumer Thierry Wasser and his assistant Frederic Sacone who have faithfully restored the latter in 2014 using original ingredients, I am able to describe it for you. Chypre de Paris (1909), is a Jacques Guerlain creation authored just 10 years prior to Mitsouko - the perfume that is considered Guerlain's quintessential chypre and indeed, one of the world's finest. It is a curious perfume which - whilst not at all a chypre by definition - manages to almost get there in the end. Perhaps one of its most fascinating features is it's unexpected flight of leather and spice... it feels warm and a little bitter, and is imbued with classic notes of bergamot and lavender, although these notes tend to play second fiddle. This slightly acrid sting in the opening remains present from beginning to end - almost acting as a place-holder for a classic chypre component of oakmoss, which is completely absent from this composition. A very Guerlain-esque arrangement of florals (jasmin, iris, ylang-ylang and rose) collude against a more burly accord comprised of civet, opoponax, patchouli and nutmeg. The sum of these two contrasting facets feels seamless - a fine balance of muted prettiness and woody, earthy brawn. A departure from "regular" chypres, the trail feels somewhat sweeter... vanilla and musks dominate. If a classic chypre is measured by a distinct contrast between fresh cirtus topnotes and a woody, mossy base, then Chypre de Paris does not conform. There is insufficient bergamot and zero oakmoss present. However, there is a general sense that it was heading in the right direction, even if the very perfume that defined the category hadn't been conceived yet. When measured against the glorious evergreen citrus peachiness of Mitsouko with its parched mossy / musky base, it is easy to understand why Chypre de Paris might have been retired in favour of Guerlain's enduring perfume pillar and 'Grand Dame'. Nevertheless, this perfume is a fascinating interpretation on a theme that later, took the world by storm. This concludes Series 3 of "5 rare Guerlains in 5 Days". If there is any interest in a fourth series, kindly leave a comment. Hindsight is an incredible thing. When we study the rich Guerlain timeline here in 2014, we are able to contrast and compare, to draw parallels and recognise patterns which, at another time, might not have appeared as conspicuous. For a house with more than 700 perfumes to their credit - each one a single daub of paint on a vast canvas - we glean a greater understanding of the artwork when we view it from afar. 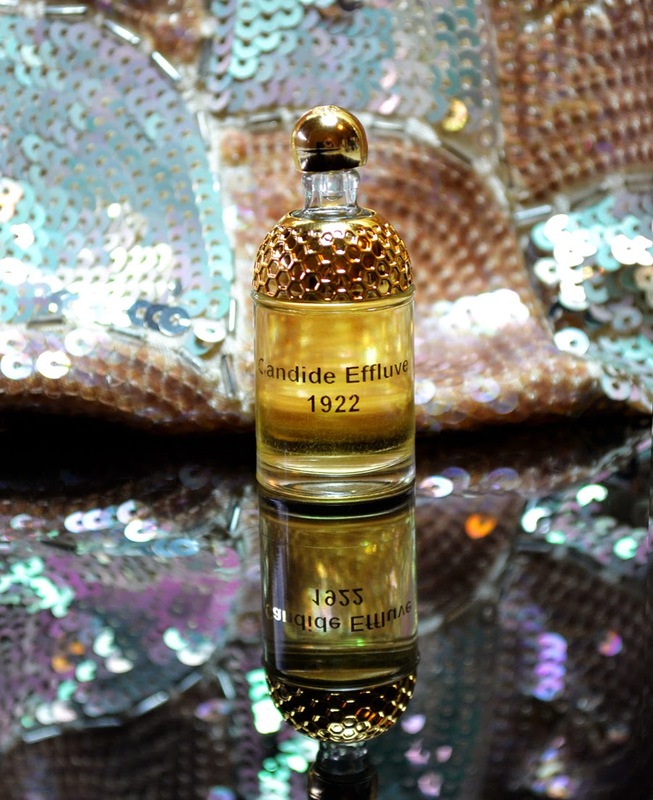 Just as Sorcery of Scent has looked at post-wartime perfume models in my article earlier this week, today's perfume, Candide Effluve (Innocent Emination) - a Jacques Guerlain creation of 1922 - is another telling creation from the Guerlain archive. Candide Effluve places a marker precisely between two distinct periods... the Art Nouveau era (1880 - ca. 1916), and the Art Deco age (ca. 1924-1940). In aesthetic terms, what we know about the Art Nouveau movement is its somewhat bohemian inclination towards organic lines and natural forms. Art Deco on the other hand, celebrated lavish ornamentation and bold geometric shapes. Compare, for example, the flacon 'bouchon cœur' created originally for L'Heure Bleue (1912) with it's curved heart-shaped stopper and gently spiralling shoulders; to the iconic 'flacon tabatière' produced to house Liu (1929) whose square-shouldered black glass form is resolutely Art Deco in style. Candide Effluve, presented in the smoky Baccarat 'brun fume' flacon seems to sit somewhere in between... its shape suggestive of a piece of fruit or the human form, but with hard, faceted edges. Of course, not only does it's appearance straddle the line between the two design philosophies, but the perfume it holds does too. Candide Effluve retains a good measure of pre-war conservatism... a little of that wistful poetry á la L'Heure Bleue. Jacques Guerlain has re-used a number of components common to his Belle Epoque / Art Nouveau creations (not least heliotrope, violet, iris and rose which feature heavily in his earlier compositions), but has also managed to give his new creation a sense of Art Deco opulence and optimism. A sunny and spirited flight of lilac and violet feels fresh, vibrant and youthful, but underneath, the heliotrope seems to tether it to a more mature space. Lily-of-the-valley and jasmine lend a bright, distinctly feminine feel, however a spreading cloud of patchouli and benzoin bring it back to ground again. Perhaps one of the more prominent components is ylang-ylang - it feels spicy, lavish and luxurious... a flash of gold in the shadows. It cavorts and beckons over a delectable vanilla / ambery trail. Candide Effluve is a scent that shows some restraint, and I can't help but imagine a young girl born to very conservative parents who has just come of age and is dying to throw on her flapper dress and go out dancing. It feels like a perfume that darts between cautious maturity and reckless juvenescence. It might have been Jacques Guerlain's intention to have this perfume appeal to women of any age... those with one foot planted in yesterday, or one foot planted in tomorrow. Whatever the truth, it takes a clear snapshot of its time; an important transitional period when philosophies and ideologies were being refashioned. As a young boy, I grew up in a home curated and decorated with mother's federation-style tastes. An old Singer sewing machine sat atop a cast iron base in our den; sombre floral prints in heavy jacquard adorned sofas and windows, and porcelain Victorian dolls gazed blankly at Art Nouveau wallpaper from turn-of-the-century prams. A large hand-turned wooden plinth stood in the corner of our lounge that held a broad woven basket full of dried roses... mother had collected them as glorious fresh stems and hung them upside down for weeks until their brittle moistureless corpses could be added to the pile. Peculiarly, those fresh thousand-coloured blossoms that once dazzled the eye, when left to dry, shrivelled into a restrained palette of burgundy and ecru. What I remember most about this boneyard of flowers (besides mother occasionally dusting them with a hairdryer), is their odour. The velvety sweet perfume of the juvenile blooms had long gone, replaced instead with the stink of decayed organic matter that to my nose, was two parts repulsive to one part fascinating. Occasionally, if I felt brave, I would lean over them and sniff timidly, repelled by their fetor and yet somehow attracted to their unusual aroma of tea grounds and subtle spices. As a direct result of this vivid recollection from my youth, I have always been attracted by the name of Guerlain's turn-of-the-century perfume "Fleur Qui Meurt" (A Dying Flower). 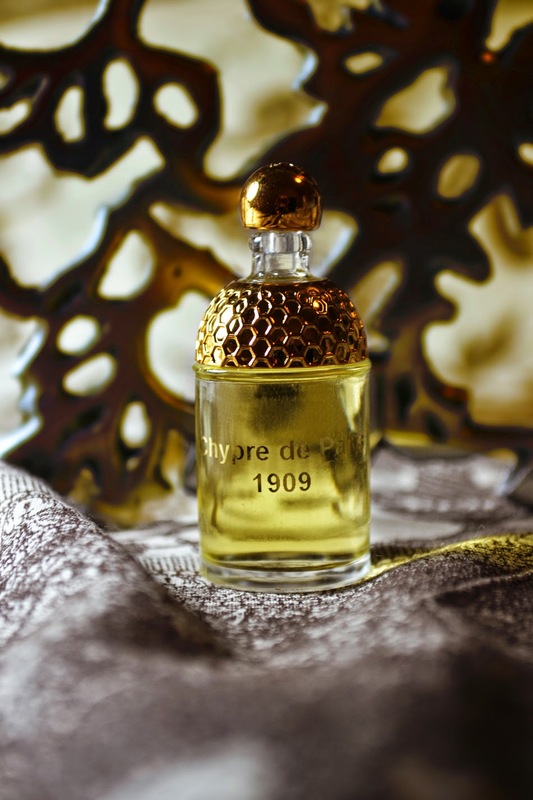 Fortunately, thanks to the efforts of Guerlain nose Thierry Wasser and his assistant, Frederic Sacone, I am now able to indulge my curiosity and experience this scent just as it existed in 1901. 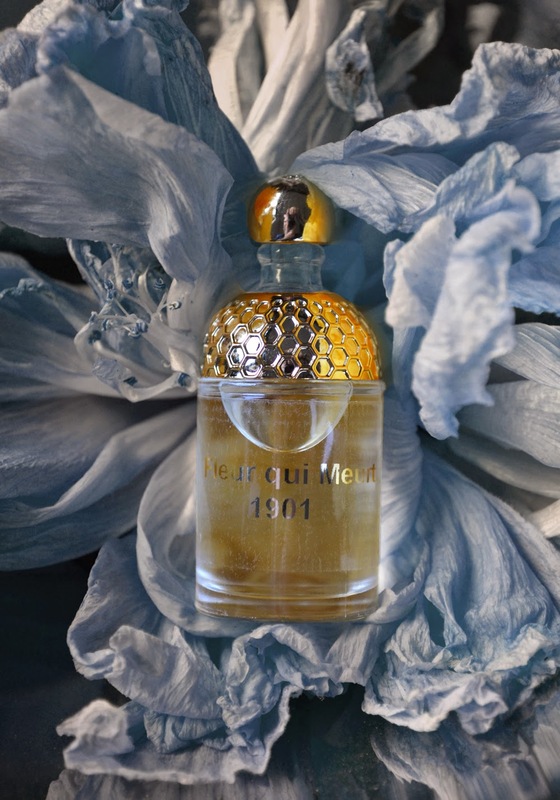 Jacques Guerlain's Fleur Qui Meurt is an example of Guerlain's consummate artistry. Whilst the vast majority of perfumers working at the turn of the last century were still marketing soliflores or attempting to capture the true essence of various blossoms, Jacques was turning the very idea of perfume on it's head by creating a scent that honoured the end of life. Perhaps inspired by something as simple as a vase of wilting flowers, or maybe as life-altering as an experience from his personal life, we will never truly know... but this fragrance is an artful rendering of blossoms as they wither and die. His composition opens with a glorious violet which is not too far removed in style from Aprés l'Ondée, a scent that he was to author just 5 years later... but perhaps one that feels somewhat less cold and damp. The violet here is robust and has been warmed by the sun, and is underpinned by leafy green notes that have a similar velvety, nectar-like texture. This is the flower in full bloom. But mere minutes in, the flight takes a gentle downward turn and the violet disintegrates... still present, but flailing somewhat, like the perishing prima ballerina in a production of Swan Lake. A lilac-white coloured ribbon of iris lends a husky, dry quality to the composition, and darker, earthier accords begin to seep in. Dry vetiver and dirty patchouli hint at decaying roots that have been torn from the earth, whilst a rising mantle of musk lends a distinctly organic feel. Here is where Fleur Qui Meurt begins to defy description... it becomes a quickstep of beauty and fragility... fluttering petals and writhing stems seem to sense the inevitable coming. There is a luke-warm almost salty quality in its trail... it suggests a long expulsion of breath; a final sigh from which there is no coming back. Jacques Guerlain's study has resulted in a very thought-provoking creation - one that traces the cycle of life from beginning to end. It's beauty perhaps lies in the futile struggle between life and death, and succumbing to the inescapable. As we all are destined to eventually follow the same course, I can help but feel Fleur Qui Meurt might have been intended more as a metaphor for humanity. All will fade in the end. 1937 marks the year perfume heir Jean-Paul Guerlain was born... the baby boy who was to grow into the man who would be the fourth successor to the title of Master Perfumer at Maison Guerlain. 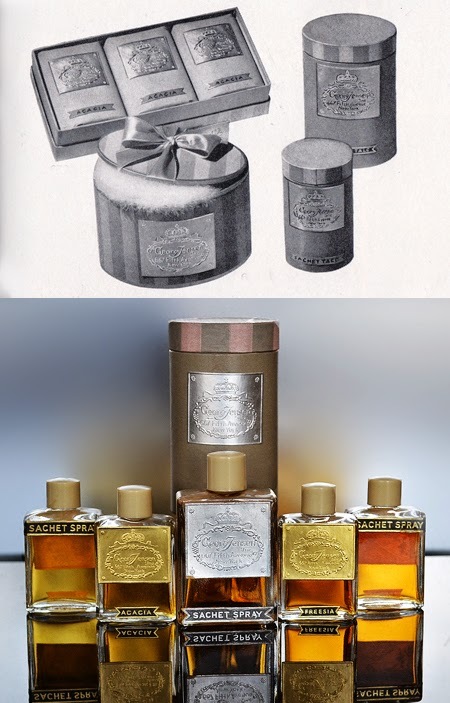 It is alleged that Cachet Jaune - a Jacques Guerlain creation - was created as a gift for Jean-Paul's mother the very same year. Produced solely in an eau de cologne concentration and presented in the now-iconic watchface-style 'flacon montre' (later used to house a variety of Guerlain eaux de colognes), it is fascinating to discover that contemporary Guerlain perfumer Thierry Wasser and his assistant, Frederic Sacone have reprised Cachet Jaune for visitors to experience at the Guerlain boutique in Paris, in pure parfum form. The author never had the honour of sniffing the somewhat diaphanous eau de cologne, but Cachet Jaune the parfum has immediate presence. A brisk aromatic green flight of rosemary and citrus rush over the receptors when this is first applied to skin... it feels verdant and succulent to the nose. A candy-like undercurrent of vanilla shifts the parfum's flight from a 'cologney' treatment, to something more saccharine... one's mind can't help but wander back along the Guerlain timeline and recall the pastry-like deliciousness of L'Heure Bleue, but here - albeit somewhat cursory - there is a sensation of delicious, zesty lemon curd. But all at once, just as one starts to succumb to it's ambrosial gourmand qualities, a titanic note of carnation shifts forward, pressing up from below with its heart-swelling combustable warmth and peppery prickle of spices... it is carnation in profusion; a multitude of crepe-like ruffled petals releasing their bold, commanding perfume. This astonishing carnation is underpinned by signature Guerlain florals (jasmine, iris and rose, which indeed feature heavily in the Guerlain DNA)... but a generous measure of musk at its core pulls the composition away from a resolutely feminine bouquet and gives rise to a coarser, more physical facet. These delightful components simmer over a classic Guerlain foundation comprising amber, vanilla and tonka. After some hours, as the last remaining molecules of perfume evaporate from skin, I crave the sweet aromatic spiced floral aspects that were so abundant in the beginning. I long for those generous sunny hues that seduced my nose - as it did Jean-Paul's mother's - so many decades ago. Such a pity that Cachet Jaune never appeared resurrected next to Vega and Sous le Vent in their most recent incarnations, as was originally intended. For lovers of carnation, and for those simply hankering for a unique olfactory snapshot of the 1930's, Cachet Jaune has it in spades. This week Sorcery of Scent will reprise its "5 Rare Guerlains in 5 Days" series, in which we focus on one scarce perfume each day for five days from the house of Guerlain, that are either inaccessible to many or simply lost to the sands of time. In 2014, Guerlain perfumer Thierry Wasser and his assistant Frederic Sacone set to work examining antique Guerlain texts in an effort to unravel the Guerlain DNA. 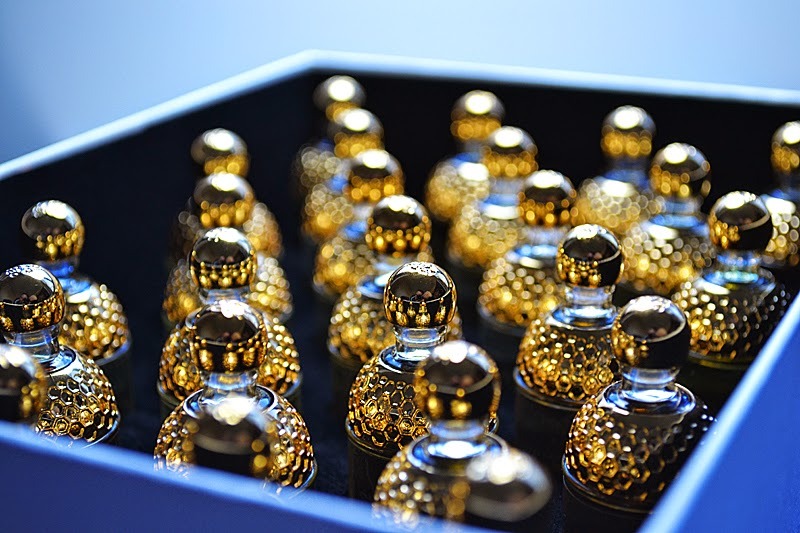 In doing so, they have resurrected 25 parfums from Maison Guerlain's sweeping timeline and have recreated them faithfully so that they smell today precisely as they would have up to 140 years ago. Limitations on the use of specific raw materials have rendered these perfumes (in their original form) not suitable for sale, however they can be experienced on paper mouillettes at Guerlain's flagship boutique at 68 Champs-Elysées or at L'Osmotheque in Versailles. 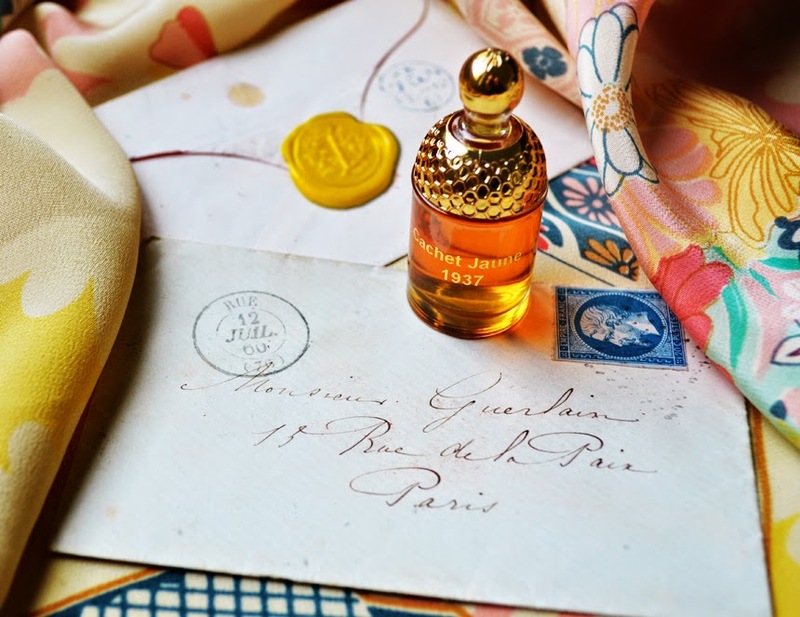 At a closed-door event held at Guerlain in April of this year, an intimate group of 12 hand-picked bloggers were invited to explore and discuss these perfumes at length with Guerlain's messieurs Wasser and Sacone and mesdames Delacourte and Pichard. Each participant received as a gift, an exquisitely presented coffret containing 25 x 7.5ml pure parfum samples of the restored perfumes. Sorcery of Scent was a humble recipient of this coffret, and it is from this source that the "5 Rare Guerlains..." series will be sampled. Today, Jacques Guerlain's mid-century masterpiece Atuana (1952). In the years immediately following a World War, there has always been a visceral sense of optimism that penetrates the global psyche. Mankind looks to the future to reaffirm for ourselves that wartime horrors are behind us. This becomes evident in many areas... fashion, architecture, furniture design and indeed, perfume. After the atrocities of The Great War, scores of perfume houses embraced fresh, new sanguine perfume themes, and for Jacques Guerlain, he found far-flung exotic landscapes his muse. Sous le Vent (1932) transported us to the breezy tropical Antilles and Vol de Nuit (1933) on a moonlit equatorial night flight. Both embodied this renewed sense of hope where freedom and aspiration resonated with the world. Similarly, in the years following World War II, an almost identical strategy was employed. For Atuana - one of Guerlain's first major commercial releases after the war - Jacques Guerlain took influence from the life of painter Eugene Henri Paul Gauguin who spent his last years living and working in French Polynesia. For Gauguin - and perhaps Jacques - the island of Tahiti offered boundless colour and inspiration. This being said, however, Atuana is not necessarily what one might imagine it to be. One could expect the perfume of tropical blooms ablaze with colour, or the scent of salty air and dappled sunshine, but Atuana is devoutly less vivacious. Still clinging on to a sense of war-time sombreness, yet perhaps offering a tiny inclination towards the more spirited releases that lay just over the horizon (such as Chant d'Aromes, Nahema and Chamade), Atuana is a scent of contradiction. Her semi-herbaceous opening of lavender and timeless aromats feels resolutely classical in its approach (including a familiar anise-like note that is present in other Guerlains) and yet in the same moment she feels even-handedly contemporary. The unusual flight gives rise to a heart that diverges down two distinct paths... one littered with soft jasmine petals and lily, and the other a darker, more earthy avenue where vetiver and leather play an integral role. Whilst marketed to women, Atuana's inclination is perhaps more to the masculine side than the feminine as these more robust, elemental facets take root. The astonishing leathery nucleus is a far cry from the stinging, tarry smokiness of Guerlain's Cuir de Russie... rather, it is a striking ashen leather... one dusted with a film of powdery grey cinders. To that length, it is interesting to examine Atuana advertising from the 1950's, specifically those picturing the repeated use of ash-coloured stone as a major design element. This ashen, almost incense-like quality, perfumes the skin long into the drydown. Whilst my mind tries to draw parallels between what I smell and what I know about French Polynesia, all I find is disparity. I can't forge any true connection between the pair - nothing obvious at least - but what I do recognise is that Atuana and Ode, launched just 3 years later, both stand astride two major periods in world history. One is the fragile boundary between WWII and the suspension of hostilities, and the other; the end of Jacques Guerlain's reign as master perfumer before an enthusiastic young Jean-Paul ascended to the throne. In the world of flatware, holloware and jewellery, few can compete with Georg Jensen - an internationally renowned Danish silversmithy that has stood at the apex of modernity for the past 110 years. Georg Arthur Jensen opened his workshop in Copenhagen in 1904 and since, has pioneered the popularity of Scandinavian style on a global scale. Embracing forms from the natural world, he rapidly developed a style that became instantly recognisable as his own. In the decades since his passing in 1934, some of the world's most revered designers and sculptors have contributed to his universe including Henning Koppel, Vivianna Torun, Sigvard Bernadotte - each of them leaving their own modernist fingerprint on exquisite jewels, tableware and homewares which are still produced to this day at the original foundry in the Danish capital. Georg Jensen the brand, is a celebration of elegance across the ages. In the first 25 years of business as Georg Jensen found his success in the Nordic countries, the flagship Danish foundry was employing a whopping 250 full-time workers. However, thanks in part to their patronage at a string of expositions and world fairs, demand for Jensen's work was being requested from abroad. Stores were opened in Berlin and London, and a campaign was set into motion in the 1920's to win over the American market. It was this move that eventually resulted in the production of a handful of exceedingly rare Georg Jensen perfumes. Seldom seen today, this cachet of scarce scents marks an interesting turning point in the Georg Jensen timeline in the following account of resourcefulness and spectacular impropriety. Georg Jensen's New York operations were led by Danish art dealer, Frederik Lunning. He was hired by Jensen's marketing department to arrange silverware exhibitions in the US in an attempt to cast light on the Georg Jensen brand in America. As a result of his efforts, a flood of new orders rolled in to Copenhagen and shortly thereafter, Lunning opened and managed the Georg Jensen boutique on New York's esteemed Fifth Avenue. There, he imported pieces directly from the Danish silversmithy to an adoring and well-heeled New York throng. However, by 1940 the German invasion of Denmark resulted in the end of exports, and as a result, the world's markets were suddenly bereft of Georg Jensen jewellery and holloware. Lunning was left managing a boutique without stock, much to the disquietude of the Americans. A resourceful businessman, Lunning applied for - and was awarded - sole agency rights in America for 100 years via Royal Copenhagen, the then-parent company of Georg Jensen. This marked a shift in his strategy... he expanded his fifth avenue boutique to cover 3 floors and created something of a department store - one bearing the Georg Jensen name. He filled its rooms with countless decorative items - lamps, clocks, linens, figurines, furniture, clothes and handbags - the vast majority sourced locally. Lunning then employed two local American designers to design and produce silver jewellery in the Georg Jensen style which was stamped with "Georg Jensen Inc. USA"... but these pieces were sold as original Scandinavian-designed Georg Jensen pieces. Meanwhile, with war raging in Europe, Copenhagen was none the wiser. "A nostalgic essence reminiscent of the great Acacia courts of Southern gardens". Lunning's scents were presented in decorative stoppered crystal flacons, hand-painted bottles, or in more conservative travel presentations such as the square-shouldered 'Sachet Sprays'... toilet waters sold with screw caps (with atomiser attachments offered for sale separately). They were all emblazoned with the iconic Georg Jensen crest. A series of bakelite/sterling silver purse atomisers and a string of luxurious bath presentations were produced to complement the perfume lines... shave lotions, bath oils, soaps and sachet talcs... all of which were heavily advertised in local newspapers such as The New Yorker, and further afield across the United States. 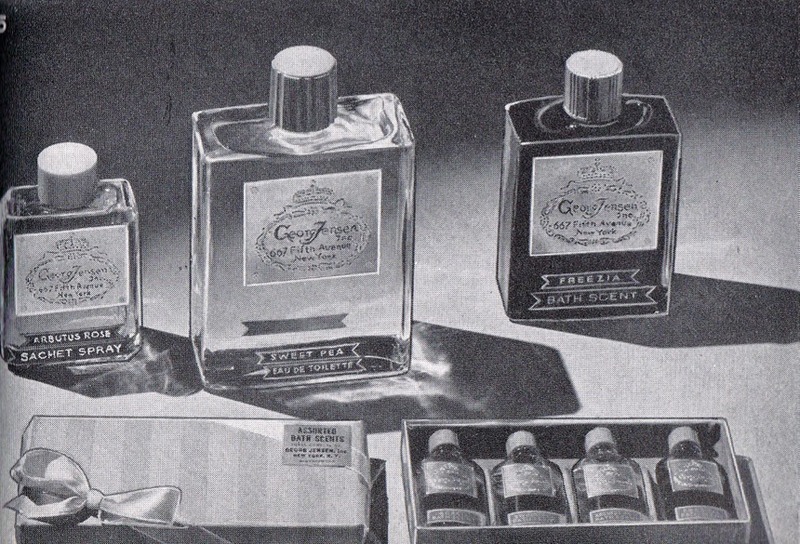 It appears the Georg Jensen branded perfumes gained popularity, because by September 1947, Lunning had negotiated distributorship with a number of gift shops. Below, an advertisement in the Valley Morning Star in Harlingen, Texas. Given the profusion of toiletry products and the vastness of the brand, it is somewhat suprising that so few examples have survived to this day. Lunning may have introduced Georg Jensen fragrances to the Americans, but his vision of a department store-style shopping destination also saw him line his vitrines with other well-known fragrance brands; Chanel, Worth, Weil, Ciro, D'Orsay, Schiaparelli, Caron, and Prince Matchabelli to name a few. But at some point along the timeline Lunning's bubble had to burst. Eventually Copenhagen were going to discover his wrongdoing, and by 1948 after tensions had finally settled in Europe, they had. After the war, Georg Jensen were shocked to hear of Lunning's American production. The Georg Jensen brand had been irreversibly compromised, and the reputation Georg Arthur Jensen had built had been weakened. Lunning had broken the strong tradition of Danish style and order, and in 1950 was sued by the company in Copenhagen for damages. However, because Lunning had had the foresight to secure trading rights in the USA for 100 years, he and his heirs continued to sell locally sourced goods under the Georg Jensen name until the Fifth Avenue store finally closed for always, in 1980. Whilst an important chapter in their history, to this day Georg Jensen refuse to recognise the artefacts Lunning had produced on American soil as genuine Georg Jensen articles. To this end, jewellery and silverware stamped with Georg Jensen Inc. USA are collectable, but not faithful to the brand. It would appear the numerous perfume presentations Lunning launched are also on the outs, but to perfume collectors, historians and Georg Jensen aficionados, they represent Lunning's resourcefulness in bringing a little luxury to the Americas. The author has procured three sachet sprays and one sachet talc. Unfortunately the latter "So Gaie" - a very fine pink powder - has lost its perfume, but the former trio are unique and individual in their own right. Here are some perceived notes, according to my nose. Fire Orchid: A citrus/floral flight (bergamot, carnation, narcissus)? which is diminished quickly by a rising vein of musks and peppery woods. There is a combustable warmth at its core. A husky, woodsy trail with echoes of ambergris and incense. Acacia: Verdant greens in the opening blanketed by dewy, velvety violets (think: Apres l'Ondee) which gives rise to the nectarlike sweetness of acacia blossoms. There is a slight tangy/spiciness beneath which is supported by a woody base. Freesia: An aldehydic opening with a profusion of white flowers (freesia, jasmine, gardenia?). A light huff of carnality (tuberose?) which dances over a woody / musky base. 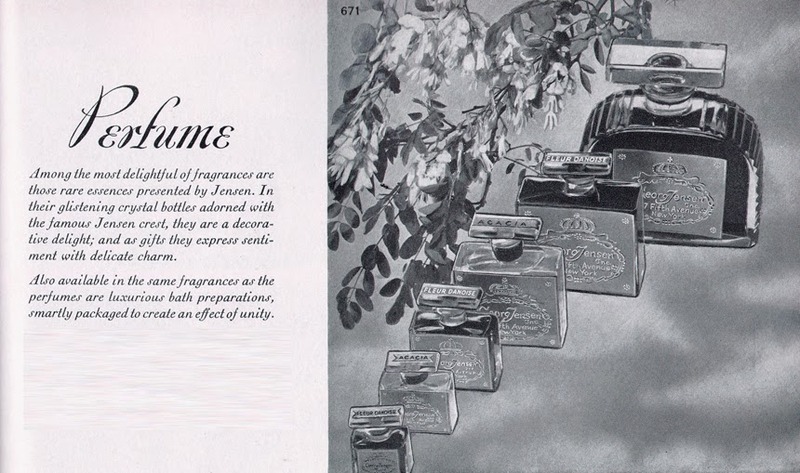 Shortly, Sorcery of Scent will be reviving our ever-popular series titled "5 Guerlains in 5 Days"... a succession of articles focusing on vintage perfumes from the Guerlain stable that have been long since lost to time. As a recipient of a unique coffret of Guerlain parfums that trace 25 important releases along the Guerlain timeline from 1877 to 1952, I will be writing a few words about these scents that once shone brightly yesteryear. 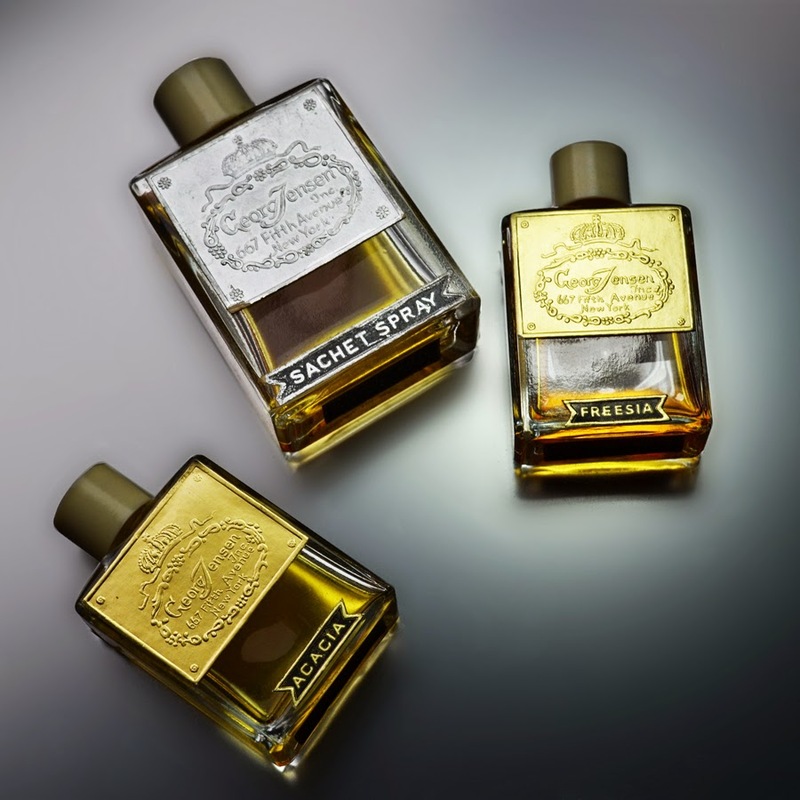 Lovingly restored by perfumers Thierry Wasser and Frederic Sacone from antique Guerlain texts, these pure parfums exist today just as they would have a century ago. Pao Rosa (1877), Jicky (1889), A Travers Champs (1898), Voila Pourquoi J'amais Rosine (1900), Fleur Qui Mert (1901), Mouchoir de Monsieur (1904), Parfum des Champs-Elysees (1904), Voilette de Madame (1904), Apres L'ondee (1906), Sillage (1907), Muguet (1908), Chypre de Paris (1909), Mitsouko (1919), Bouquet des Faunes (1922), Candide Effluve (1922), Guerlinade (1924), Shalimar (1925), Djedi (1926), Sous le Vent (1934), Cuir de Russie (Jacques Guerlain 1935), Vega (1936), Cachet Jaune (1937), Coque d'Or (1937), Fleur de Feu (1948), Atuana (1952). Stay tuned as the first series kicks off mid-May.